The kind of food you choose to feed your dog depends on lots of different things: what your dog likes; his size; your lifestyle; your budget, to name just a few. If you have an Irish Wolfhound, chances are that you’re not going to choose to feed your dog canned food. Considering how much food a Wolfhound eats per day, it would be cost-prohibitive for most people to feed canned food, especially if you were trying to feed a top quality food. These are some of the things you should consider when choosing a food for your dog, along with the actual quality of the food. Online dog food sites like Chewy.com have made a difference for many people in what kind of food they can buy. Not only do these sites offer a wider selection of foods at a good price, but having dog food delivered to your door can also change what you feed your dog. A small person doesn’t have to worry about trying to carry large bags of dog food, for example. You can order cases of canned food and not worry about the weight. You can try any kind of dog food you think your dog might like. Even frozen raw and freeze-dried foods are easy for people to order now. You don’t have to live in a large city to be able to buy good quality dog food for your dog. With these things in mind, here’s a look at the different kinds of dog food. There was a time before kibble but most people living today are too young to recall it. For thousands of years people fed their dogs leftovers, the parts of animals that people didn’t want to eat, or a mix of scraps and grains. Dogs that were highly regarded such as favored hunting dogs or beloved pets sometimes got better food with more meat or other things people believed to be healthy. It was only in the 1860s than an American in London named James Spratt was inspired to make a dry food for his dog in a biscuit – much like the ration used by sailors at sea at the time. The “Patented Meat Fibrine Dog Cake” was the first of its kind and led the way to the dog food industry we know today. You can read a good overview of the early dog food industry here. Pet food companies have proprietary recipes for their foods. Even if the food is made by a co-packer, the recipe is supposed to be unique to the individual food. Many larger companies have the facilities to make their own foods, including canned foods. Smaller companies may not make their own foods or they make make their kibbles but use a co-packer for their canned foods. This is because canned foods require different machinery than dry foods. In either case, recipes will be specific to each company’s foods. The process to make kibble begins by mixing the wet and dry ingredients together and creating a dough-like mixture. This mix then goes into a piece of machinery called an “expander.” This machine uses hot water or pressurized steam to cook the ingredients. The mixture is under high pressure and high temperatures while it’s in the expander. Then the dough is pushed or “extruded” though holes that are specially-shaped and cut into small pieces. Think of it like pushing Play-doh through a Play-doh factory to make special shapes. At this point the dough is still under pressure but once it’s extruded and the pressure is released, the pieces will puff up. These are the pieces of kibble destined for your dog food bag. The kibble still has to be dried in a drier then sprayed with fats, oils, vitamins and minerals. Afterwards it is quickly sealed into a bag so the fats and oils won’t spoil. You can view the entire process here. A few companies make dog foods that are baked instead of extruded. As far as we know, baking doesn’t make a dog food any more nutritious than extrusion. However, the baked foods we know about seem to be good quality foods. Baking dog food is a slower process. The dough does not stay at such high pressure or high temperature as it does with the extrusion process. It’s more like the way you would bake cookies. Companies that make baked foods say that the foods are easier for dogs to digest but we have not seen evidence of this claim. AvoDerm, FreshPet, Lotus, Oven-Baked Tradition, and Carna4 all have baked dog foods. We have to say a word about Salmonella, e. Coli, and other reasons for recalls. You should be aware that any company can have a recall at some time, even companies with the best reputations and practices, and companies that use the best ingredients. Many recalls are due to Salmonella. This is a very common bacteria and a frequent cause of human food poisoning in the United States. It can come from lots of different sources, including chicken eggs and other ingredients used in pet foods. The people most at risk when there is a recall due to Salmonella are infants, small children, and the elderly, as well as anyone with a compromised immune system. Most dogs are not affected by contact with Salmonella unless the dog is already weakened in some way. (Remember that your dog has strong stomach acids that usually let him eat dead animals and some kinds of garbage.) Pet foods are sometimes recalled because of public health concerns more than concerns about pets. Some foods have been recalled in the past because of the presence of aflatoxins (the toxic by-product of a mold) and this problem can be deadly for dogs. In some cases foods are recalled because they contain dangerous objects that accidentally get into the food during production (metal, plastic, etc.). Or food can be contaminated from outside sources in some way, as it was during the melamine recalls in 2007. So, recalls are always something to take seriously. With that said, if you do have a food that is recalled, check the lot number to make sure it is included in the recall. Keep the packaging (bag or can) and a small amount of the food in case it might be needed for testing later. Stop feeding the food immediately. If your dog shows any symptoms that worry you, take him to the vet and report the incident to the pet food company. You should also call the FDA to report the case. 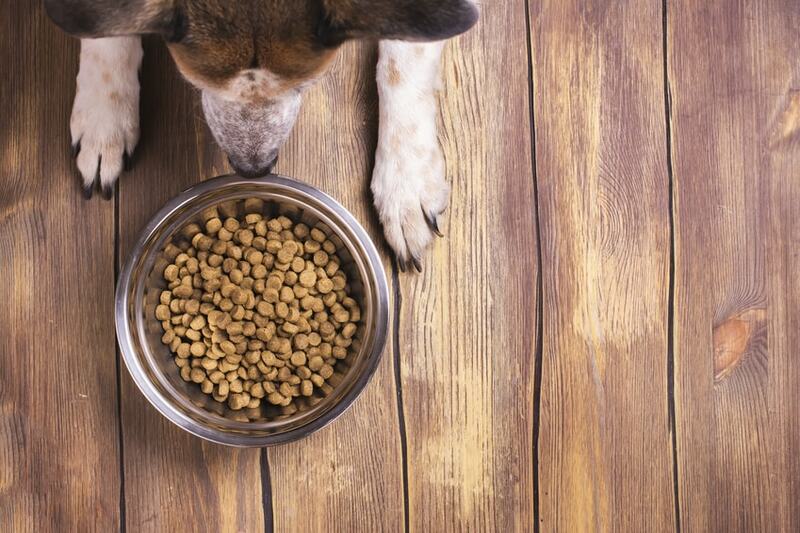 Recalls can affect all kinds of dog foods, including canned foods and raw foods, but since there is more kibble sold in the U.S. than any other kind of dog food, we seem to hear about more recalls affecting dry food than other kinds of dog food. We consider dehydrated dog food to be a kind of dry dog food, so we’re listing it here, though it could be argued that it is also similar to freeze-dried foods. Dehydrated foods have had much of their moisture removed. Many of these foods are still raw before they are dehydrated. The Honest Kitchen is probably the best-known dehydrated dog food but there are others. ZiwiPeak is another good dehydrated dog food and Addiction Raw Dehydrated dog food is another good food in this category. Dehydrated dog foods have a number of benefits. They are not cooked at high temperatures so they don’t lose all the nutrients through cooking and processing that kibble foods do. Dehydration keeps the foods from spoiling without requiring a lot of preservatives. Some dehydrated foods need to have warm water added to rehydrate them before you can feed them to your dog, but some don’t. Some of the companies that make dehydrated dog foods add dehydrated raw food to their kibble to give it an extra amount of protein. This is true with Nature’s Variety Instinct Raw Boost, for example. This category is growing. These foods are more expensive than regular kibble but since the food has had so much moisture removed, you feed your dog less. Dehydrated dog food also has some of the same advantages of kibble. The foods are dry so there’s no mess. They come in bags (or boxes) and they are easy to carry and store. No freezing required. Wet foods include both canned foods and food in pouches so we’ll discuss them separately. Canned dog foods can be a good choice for your dog, especially if you have a small or Toy breed. They cost more per ounce than kibbles, so they are less popular with owners of large dogs as a main meal, but some owners of big dogs like to use them as a topping or special treat. If you have a small dog you may want to consider using canned food as your dog’s main diet. Food in cans often has a moisture content that is up to 78 percent. If the food is labeled “in sauce,” “in gravy,” or a stew, the moisture content can be even higher – as much as 87.5 percent moisture. This may not sound like it’s much more, but when you figure the dry matter basis for the food it adds up. Canned food usually has a much higher percentage of protein (by dry matter) than dry dog food. These foods are often higher in fat, though they have relatively small amounts of carbohydrates compared to kibble. The higher protein and fat content, as well as the real food taste, help explain why these foods appeal to dogs so much. As mentioned elsewhere, canned foods go through a different manufacturing process compared to kibble so they don’t require the higher amounts of starch to form a dough/batter. They need just a little starch to provide the food with some texture, form, and shape. Many canned foods use ingredients such as guar gum or cassia gum (natural thickening agents) for this purpose. Gums are GRAS (generally recognized as safe) by the FDA, though some people raises issues with various gums. Some foods use corn starch or carrageenan. Cooks will recognize corn starch as a thickener used in human cooking. Carrageenan has been used for hundreds of years. It’s made from seaweed. It’s used in many human foods as well. However, it has come under fire as a digestive irritant and it’s use is restricted in some foods and baby formulas. Lower quality canned foods may use wheat flour as a thickener or add rice or other grains. Some foods do not use thickeners in their canned foods but rely on using thick cuts of meat. These foods may be high in protein but check to be sure they are AAFCO-approved as a complete and balanced diet and not just a food supplement. Canned food can be a good choice for senior dogs who are starting to lose their appetite. So, depending on your circumstances, canned foods can be a good choice. As you might expect, canned foods vary in quality. You should read labels and check the guaranteed analysis of these foods. It’s particularly important to figure the dry matter basis when considering canned dog foods. With kibbles this is usually less important since the moisture content is usually 10-12 percent. This means that the DMB for protein, fat, and other nutrients are not usually too much different than the figures provided in the guaranteed analysis (though you must know the DMB to estimate carbohydrates). This is not true with canned foods. A can of dog food is mostly moisture so you have to figure the DMB to know how much protein, fat, and other nutrients are in the food. If a can of dog stew has 82 percent moisture, you would subtract 82 from 100 (100 percent is the whole amount). This means there is 18 percent dry matter in the food. Let’s say the food has 4 percent fat in the guaranteed analysis. You would then divide the 4 percent fat by 18 percent dry matter and get 22. This means the food has 22 percent fat after the water has been removed. If the food has 9 percent protein in the guaranteed analysis, you would divide 9 by 18 and get 50 percent protein by dry matter basis. And so on. You can do this for fiber and other percentages given in the guaranteed analysis. You can also look online to find a calculator to figure dry matter basis for pet food. These calculators let you plug in the numbers and give you the answers. If you are comparing cans of dog food you need to make sure you know what the dry matter basis is. Otherwise, you can be badly fooled. At this time dog food in pouches (“moist” and “semi-moist” products) make up a small part of dog food sales but some dogs and their owners really like them. Pouches are resealable, easy to store, and the food often has a meaty taste that dogs like. Since you can feed what you need and store the food in the fridge, they can be more convenient for many owners than canned foods. This is projected to be a fast-growing category in dog food packaging and sales. As a category, pet food in pouches do tend to have higher amounts of added sugar and salt, so this is something to check when you read labels for these products. Remember that sugar can have lots of names on a dog food label such as sucrose, cane sugar, caramel, corn syrup, sorbitol, and fructose. Fructose can be a nutrient for probiotics – in small quantities – but you probably won’t find probiotics in a pouch of dog food. Dogs (unlike cats) have a real sweet tooth, so they can become quite addicted to foods that contain these sugars. Making dog food in pouch contains is very similar to making canned foods. The ingredients and guaranteed analysis for dog food pouches are also similar to canned. Some pouched food place more emphasis on meat protein, but this depends on the brand and particular food. Be sure to read the ingredients and always compare the dry matter basis. These are separate categories but they are all growing in popularity. None of them are exactly new but they are expanding. For example, Bil-Jac has been selling frozen dog food in some areas for decades. However, there are many other companies making frozen raw dog food today. You used to find Bil-Jac tucked in the same refrigeration aisle with frozen foods in the grocery store. Today some grocery stores have dedicated refrigerated sections just for frozen dog foods. Pet food stores are likely to have a variety of frozen foods from which to choose. Many frozen raw dog foods are made by the same companies that make premium kibbles or, conversely, the same companies that make raw food diets. For example, Nature’s Variety Instinct Raw are raw frozen diets that come in various configurations – bites, medallions, patties, small bites. Nature’s Variety also makes foods with freeze-dried raw such as Instinct Raw Boost – a kibble with freeze dried raw pieces included. This line comes in lots of different formats. Stella & Chewy’s, known for their raw foods, offers both frozen and freeze-dried foods. Even Orijen, best-known for their biologically-appropriate kibbles, has freeze-dried foods in several formulas. We’ve already discussed dehydrated foods. There is a difference between dehydration, which removes the moisture content from the food, and freeze-drying. To freeze-dry dog food, it starts out as frozen, whether it’s a raw patty, nugget, or whatever form the company chooses. All of the moisture in the food is ice at this point. The food goes into a freeze-dryer at this point which uses a vacuum at very cold temperatures. In the freeze-dryer the ice changes to water vapor. This turns the frozen food to dry product without it ever thawing out. After hours in the freeze-dryer, the food has become shelf-stable and ready for packaging. Both freeze-dried and dehydrated foods are good for long-term storage, though dehydrated foods have to be rehydrated before you can feed them. You don’t have to do anything to freeze-dred foods before feeding them. You can just put them in your dog’s bowl and let him eat them as they are. (It’s a good idea to check the feeding instructions to see what the company suggests.) Freeze-drying is technically a form of dehydration but the process is completely different than the one used to produce dehydrated dog food. You can read more about freeze-drying and dehydration of dog foods here. Freshpet is a popular food in the refrigerated dog food category. They have slice and serve rolls (think rolls of cookie dough) stocked by many grocery and pet stores. They have grown from just three refrigerated products a few years ago to a whole line-up of refrigerated products now. They also make kibbles and food in tubs. From what we can tell, the best way to figure dry matter basis for these rolls of dog food is to consider them like canned dog food. The guaranteed analysis for the rolls look similar to canned foods. You’ve probably already noticed that not every food sold is “complete and balanced.” Lots of companies today, especially some of the more avant garde pet food companies, make mixes and pre-mixes for pet food owners. Mixes and pre-mixes are primarily for owners who make their own food for their dogs, whether they buy the primary ingredients from the pet food company or gather their own ingredients. These foods are used as a base and then you add fresh ingredients like meat, eggs, yogurt, etc. Some mixes and pre-mixes are sold on the basis that they are complete diets whether you add anything to them or not. Other mixes and pre-mixes are much sketchier and don’t provide much nutritional information. You should not feed these latter foods as a regular diet, though you might feed them occasionally. When fed as directed, mixes from The Honest Kitchen are complete diets, but you can add your own fresh foods to them. Their mixes called Hale, Kindly, and Preference require fresh foods to be added in order to be complete diets. There are other mixes and pre-mixes available but they may or may not be complete or have AAFCO approval. You might want to use them in rotation or contact the companies to see if they are approved by AAFCO. When you look beyond the basics of protein, fat, fiber, and carbs, there are a lot of other things in your dog’s diet. Some of the things you often see on a dog food label include prebiotics, probiotics, enzymes, vitamins, and minerals, not to mention things like glucsoamine, chondroitin, and fatty acids. If you are feeding your dog a good quality dog food and he has no particular digestive or other health problems, you probably don’t need to add any additional supplements to his diet. A good dog food is supposed to be properly balanced in terms of nutrients and supplements. Adding a lot of additional supplements can be harmful in some cases. You can have too much of a good thing. We know that making dog foods at high temperatures destroys some of the nutrients in the food. So do dog food companies. That’s why they add vitamins and minerals. If you give your dog more vitamins and minerals, you can do more harm than good. Do not give your dog a multi-vitamin if you are feeding him a good quality, properly balanced dog food. At best he will excrete the unused, water-soluble vitamins. At worst, he will get an overdose of some of the other vitamins that can be stored in the fat tissue. It’s become popular in the last few years for some people to give dogs probiotics, even if they are feeding a very high quality food that contains probiotics. While it’s debatable whether most probiotics in dog foods survive the cooking process, we also question whether it’s really necessary for people to give their dogs probiotics. If you are feeding your dog a raw or homecooked diet then giving probiotics has merit. But if you are feeding kibble or canned food, this is probably unnecessary. A healthy dog eating a good quality dog food should not need to have probiotics added to his diet. We do suggest that you give glucosamine or chondroitin separately from anything added to dog food if you are concerned about joint or mobility problems with your dog such as arthritis. These supplements cannot be added to dog food in large enough amounts to really help a dog that has pain from arthritis. Forget about buying these supplements specially-made for dogs. Go to your local drugstore or big box store to buy them for humans when they are on sale, or buy them online. Fatty acids such as omega-3 can be helpful for a dog’s skin and coat problems. Fish oil (given with vitamin E) is a good source.